Economic growth cannot occur without water. All uses of land (whether it be agricultural, residential commercial or industrial) require access to reliable water supplies. 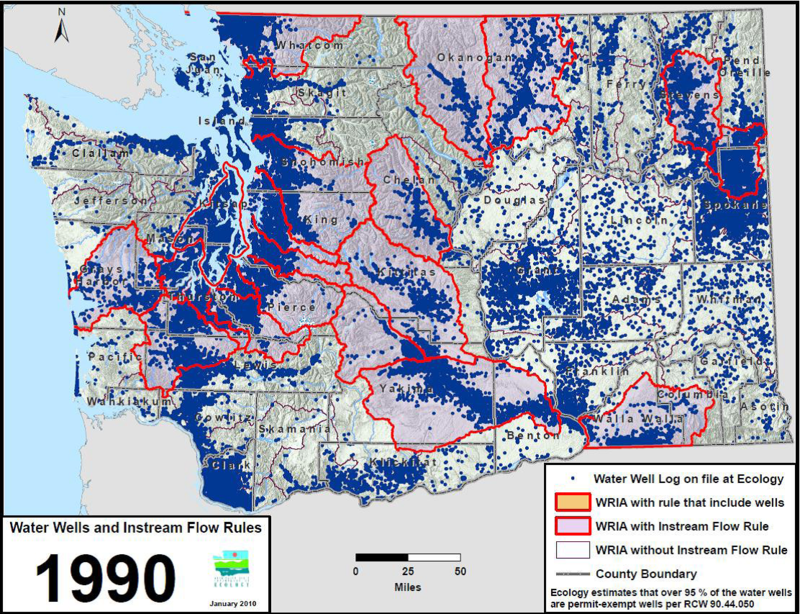 While the relationship between land use and water is fundamental, our land use laws (until recently) almost entirely failed to recognize that future growth depends upon sustainable water resources. CELP is working statewide to better integrate wise water management with the land use permitting process. That means curbing reliance on permit-exempt wells to provide water to residences, subdivisions, and agriculture. Permit-exempt wells are “exempt” from the water rights permitting process. This loophole in the state law allows the pumping of groundwater without the State first determining whether there is sufficient water, without harming other ground water wells, or impacting environmental flows in nearby rivers and streams. Because of hydraulic continuity, the underground link between aquifers and streams, pumping groundwater often siphons off water away from nearby streams and rivers. In Washington State, there are close to 1,000,000 permit-exempt wells, with new wells proliferating. Residential developers and industrial agriculture increasingly rely on permit-exempt wells because for several decades it has been difficult to procure a water right from the state. Sometimes a few pictures are worth a thousand words to explain the explosion of permit exempt wells…. These maps, courtesy of the Department of Ecology, show the striking increase in permit exempt wells over twenty years. CELP is focused on controlling this loophole, and integrating sound water management into our land use decisions. We cannot make land use decisions without ensuring that new water uses will not harm existing private uses and the public’s interest in healthy rivers and sustainable aquifers. How is CELP getting this done? · CELP helped Aqua Permanente, a group of family farmers who own junior water rights, file a petition that closed the stressed Upper Kittitas River to new water withdrawals that affect existing supply (including exempt wells) without full mitigation: the first such rule in Washington. Many other river basins in Washington are candidates for closure. · CELP introduced a bill that would have required the real estate industry to give notice to consumers when water from permit exempt wells might not be available for building a new home or other development. · CELP introduced a bill to fund comprehensive studies of water availability in the state. · CELP contributed to precedent-setting Washington Supreme Court cases on exempt wells. o One held that counties are required to consider the legal availability of water when issuing building permits. o Another affirms that state laws that set minimum flows in our rivers and streams (called instream flow rules) are the public’s property rights, and the State cannot override those public rights by rule to allow more permit exempt wells for private use. Click here to read CELP’s Proposed Water Management Strategies To Protect Instream Flows and Provide Water for Rural Development.